Syllabus, course material, homeworks, photos, etc from a previous Introduction to Microcontrollers with AVR chips class can be found here. What the AVRs are, what all the pins do, what they can do for you. Then the toolchain: soldering together the programmer kits, getting the software up and running. Download the software part of the toolchain: For Mac folks: AVR Mac Pack. For Windows folks: WinAVR and the Atmel IDE AVR Studio. For Ubuntu linux folks: "sudo apt-get install build-essential avr-libc binutils-avr gcc-avr avrdude"
Lecture on how the programmer works -- simple serial interface basics. Some basics on avrdude / GCC tools. Hook up the programming interface wire-by-wire to the Mega48 chip and flash it with a simple program. Then hook up an LED to the output port and watch it blink! Your kit has 10 resistors and 10 LEDs. If you want, you can solder them together to make [AVR: LED Blinkenlights]. If you didn't already, make labels for the signal wires. 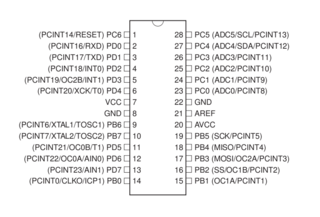 Think of an easy way to remember which go where (into the 6-pin or 10-pin header). And/or make permanent programmer "pigtails" by soldering the signal wires to a 2x3 header in the correct orientation (headers available in the HacDC hackersmart for pennies). Play around with the delays in the LED_Demo.c code. Make the blinking faster or slower. Experiment with on time and off time. How to make chips speak to the outside world, pin-by-pin. Enough C bitwise-math operations to make it work. Pulse-width modulation. Labs: Visualizing bytes, Cylon eyes, and dimming LED's. Extra credit: cross-fading cylon eyes! So you can make various lights blink and/or dim. Now what? Cross-fading cylon eyes? Patterns? Something groovy? Note that you've got an 8-bit display if you're willing to read out numbers in binary. Useful for debugging later on, for sure. What else? Binary clock? Simple upcounter? Display "random" numbers? If you could swing it around, you'd be on your way to a POV toy. Gather data from the world. The lecture ended up being just on digital input. Labs: pushbutton organ, light-dependent theremin. Laptop, meet AVR. AVR, laptop. Serial communication (plus serial-to-USB cable) lets you connect your micro to about anything, including your computer. Interrupts let the hardware (pins, serial port, timers, etc) call run functions for you, with the main body of your code picking up where you left off. Combine the two, and you can get pushbutton control of an AVR from your laptop keyboard. And as a bonus, if you run Python, serialScope.py provides a helpful debugging tool and an example of how simple USB/Serial code can be on the laptop side. Coupled with on-chip ADC, it's a (low speed, sideways) serial oscilloscope. Otherwise, a handy debugging aide. Homework: Take the scale.h from last class, and using input from your laptop, make a full keyboard out of the AVR plus speaker. Or write a ROT-13 device that takes your input and returns the encoded version. Timers/counters let you do precision things with time. Fix up that nasty audio tone from the LDR theremin. Precise timing allows you to use LED's as light sensors. It's also good for making quality analog output and for directing servo motors. Interrupts + timers = deluxe PWM. Or give your AVR a solid internal timebase. (You know you want to.) In this class, we'll scratch the surface of what you can do with timers. Talked a bit about the I2C serial protocol -- a light-weight serial multi-master bus using two wires (plus ground) and capable of addressing 127 different devices. Great for connecting to all sorts of peripherals. Demoed an $20 I2C 3-axis accelerometer using bare-minimum I2C code, with none of the error-checking that the pro's would do. But it works a charm. That's why it's called hacking, baby!